Our new rug is beautiful! The color i thought was red is more of an orange, but it looks great. You cannot beat the price, obviously, but i was pleasantly surprised at how soft it was! I would definitely recommend it to a friend... in fact, i already have! The Jacoby uses red, blue, beige, and greenish brown to create an exquisite pattern. The muted shades bring color to your space without overtaking a room. And while you're admiring its graceful appearance, you can rest easy knowing that it has durability and strength from its polypropylene construction. The Jacoby also boasts a dense, frieze pile measuring almost a half-inch thick, giving it a wonderfully luxurious appearance. Pleasantly surprised by this rug! I got a super great deal! On sale, this 8x10 rug was less than $50! I figured if I didn't love it, I could put it in one of my spare bedrooms. It's actually perfect for my family room. It's not too thin like an outdoor rug and the red isn't orange like I thought it might be from the photos. The pattern is very large so if you're looking for a small pattern it won't work. For the price I'm really glad I took this chance! Love it! Looks perfect under my dining room table. "The details say the rug has red in it, but the photo looks like it's more orange. In person could it be described as red or orange?" 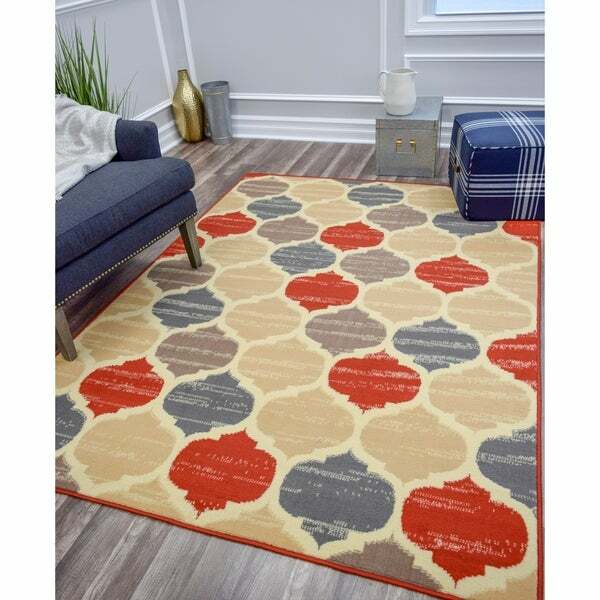 Nourison Grafix Red Trellis Area Rug - 7'10" x 9'10"